For any reverse mortgage professionals repositioning their businesses with new products and different strategies amid recent industry changes, now is the perfect time to rebrand, marketing experts say. October 2017’s Home Equity Conversion Mortgage principal limit factor changes and the waning volume they caused over the last year have many lenders and originators looking to diversify with new proprietary products or forward mortgages. For anyone on this path, there are some key steps to creating an impactful image, according to three reverse mortgage professionals with clearly defined brand messages at the annual National Reverse Mortgage Lenders Association conference last week in San Diego. 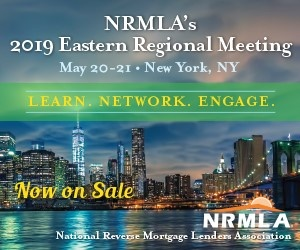 New products in particular have encouraged rebranding among today’s originators, said John Luddy, senior vice president of reverse lending at Norcom Mortgage, during the conference. Luddy is known among industry participants for his ‘Norcom Sales Tip of the Week’. Giving examples of household names that have undergone brand changes — like Johnson&Johnson changing the color of its baby shampoo to fit modern parents’ desires and Dunkin’ Donuts dropping ‘Donuts’ from the brand name — Luddy said it’s important to change with the times or face consequences like Sears, which recently filed for bankruptcy. Steven Sless, national reverse mortgage sales director for US Mortgage Corp. has put a lot of effort into his branding and identity, as evidenced with his tagline ‘More with Sless.’ He said this past year he witnessed firsthand how valuable a strong brand can be. Darius Aram, vice president of ARAMCO Mortgage, also contributed his branding know-how, offering details on the importance of a brand’s actual design components, such as a logo and cohesive fonts and colors across all platforms. “It’s a design scheme composed of a number of core elements that come together to create a distinctive look and and feel,” he said. And while those are crucial parts of a brand identity, Sless said the brand’s message is equally as important. Thoughtfulness should go into the planning, making sure the target audience and their needs are kept in mind. This message needs to be so clear that you are the immediate thought if someone thinks of your area of expertise, Luddy said. As for where to start, Sless said that a professional Facebook page can be an easy place to begin getting the who, what, and why out to your community. An important topic in the modern marketing space is compliance, but Sless said that it is possible to have your own brand and still be part of a larger company. He built his brand independent of US Mortgage, but made sure that branding components like colors were the same. As long as compliance is being met, Sless urged more reverse mortgage companies to be open to their originators and account executives taking on their own brands, as it can be beneficial to everyone. “Allowing a unique individual to go out and be their own brand and be their own business inside of your umbrella will maximize their earning potential, and it will maximize the company’s earning potential,” he said.